Ghosting home. – Dirty wet dog , boats and sailing. In the last log-blog i briefly talked about the quick 2 day voyage back to Plymouth as far as getting into Plymouth sound and across what we know locally as the ‘bridge’. It was a breezey and gusty day with something like an F5 from the SSW but i think strongly thermally accelerated. The next bit got a bit exciting as once through the narrows i had to harden up to get clear of the southern end of the naval dockyard which due to the peculiarities of wind direction and land mass can cause a short strong wind belt right on that corner. I just missed getting great footage of a Dehler 34 broaching to windward just inside of me but didn’t grin for long when i too got overpowered and flew up into the wind. I took the oppurtunity to pull a reef in and start the engine for the ducking and weaving up the Hamoaze….except that the engine then died and wouldn’t restart. It wasn’t a great problem except for the problem of getting through all the other boats and getting past the chain ferries under control : i had planned to take a break in Sandacre bay but conditions seemed ideal to shoot the Tamar bridges and then anchor to the north of the moorings after the bridge. By that time it was getting really gusty but i fetched up near to one of the local luggers also hanging on a hook there and watched the parade of yachts all heading home up the river. 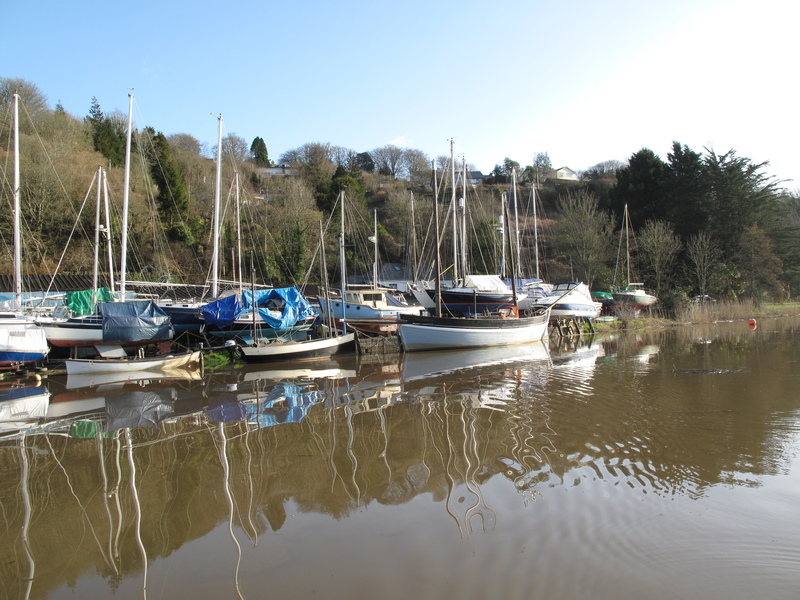 I had a break for an hour while the gusty and unstable breeze died off a little and decided that my best bet was to run up the river on the last half of the flood and see if i could get up to Calstock just around slack water, anchor near the yard and alert the boss there that i might need a hand to get alongside. One very neat thing happened just before i got into the river proper in that a boat i recognised from the yard , a freedom 35, came up behind me wing and wing and i asked them if they could get a message to the yard as they went past : they offered me a tow as the were going to anchor in the river and then go right past the yard. I decided to make a bit of an adventure of it : if i could get around the awkward sections in the wind-holes then i could probably get at least to Cotehele . Sailing up through all the Tamar moorings on a strong flood and decreasing breeze did make me concentrate on my sailing and went well, a greater problem was then getting around the big ‘S’ bend to the north of Weir Quay which took about 30 short tacks and some quick work with the paddle. I did run out of wind under the cliff where i often anchor : i guess thats why its a good anchorage so i paddled for a while there, then when i emerged onto the north-going section i was able to get the camera out and film some of the trip . I have always wanted to film this section as it feels like quite a wild and secluded river. The film is barely edited, just a few clips spliced together with a bit of music over the top. About halfway home the couple in the Freedom came up astern all ready to pass me a line but i was enjoying myself so much that i thanked them and carried on sailing. I did completely run out of wind after Cotehele quay where thereis a section of high ground and my timing was just a tiny bit late so i was running out of tide as well so i started paddling hard to get around the last corner when Chris and Julia came out in their workboat to tow me alongside. After 2 days of hard work sailing in a stiff breeze it was a relief to just ghost up the river on the tide, enjoy the scenerly slide past and listen to the gentle rustling of the reeds. Next Very dirty, very wet.